Once you try this scrumptious Brown Sugar & Cinnamon Baked Apples recipe you will want to make it every single day. And guess what? It’s so easy you will! What? Seriously? An apple? Ummmm, I was thinking somewhere along the lines of nachos swimming in melted cheese. After a while we didn’t even bother to ask any more. We just started digging fast and furious into every chip bag we could find until we heard her footsteps coming followed by the “Girls? Are you home? What do you want for an after school snack? Why don’t you have an apple?” It was truly remarkable that my mom had the uncanny ability to know the exact moment that we were digging into the chip bags. She knew it every…single…time…(without fail).Why do chip bags have to make so much dag on noise? Well guess what? Now the joke’s on me, I’m a mom of two girls and somehow, mysteriously, through no conscious intent of my own, the words, “have an apple“, now echo through the kitchen at my house. It’s like a curse or something…as I hear the familiar rustle of chips bags, I find myself casually pop around the corner with an innocent “why don’t you girls have an apple?” How can this be happening? Guess it’s true what they say about turning into your mother! And still to this day I must admit that I wonder if she was actually in cahoots with the obnoxiously loud sounding chip bag manufacturers. Now don’t get me wrong, there is absolutely nothing wrong with apples! I love apples. Adore them! Even after a lifetime of eating them daily whether I wanted to or not. And I’m so happy that I’ve instilled the love of them into my children as well. That’s why this recipe written by my tween, Sassafras, delights me so. She has gotten creative with her apple consumption and I must say that this is an easy yet decadent way to enjoy an apple. Clever, clever girl she is. 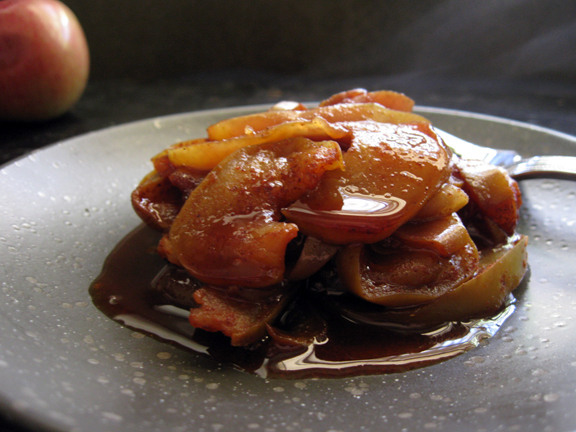 So I give to you…brown sugar & cinnamon baked apples. Here’s what you’ll need. 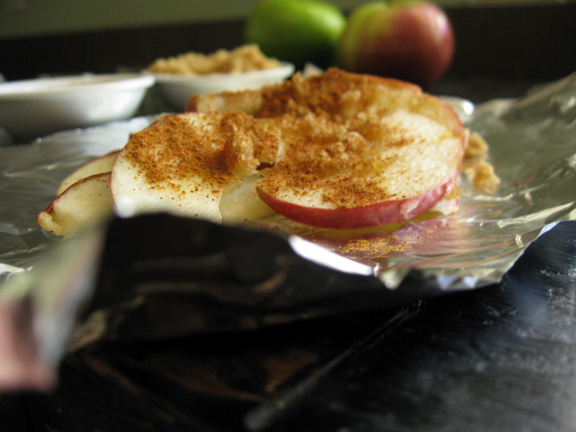 An apple, cinnamon, brown sugar, and some aluminum foil cut into squares. My daughter makes this yummy treat on a regular basis, but I’ve never attempted to do so. The night before I planned on making these sweet packets of deliciousness, I left a note with a few questions for her to answer before she left for school and I woke up to this. Instead of simply answering my questions she wrote out “her” recipe. I think that I may have a foodie on my hands! 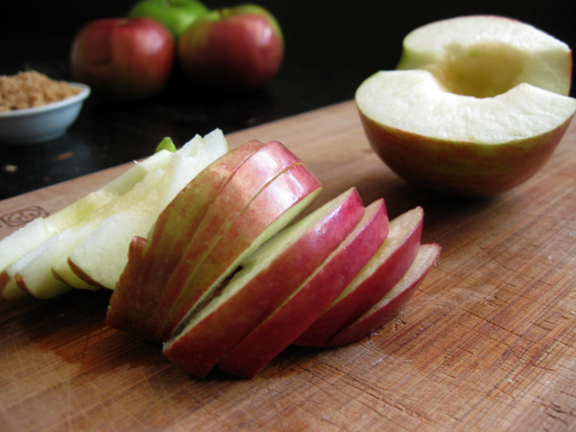 Begin by cutting an apple in half and coring it. I used a gala apple but any apple will do! Next, slice each half into very thin slices. Approximately 20 slices for each half. You’ll end up with a big pile of apples. Place all of the slices in the center of a piece of foil (make sure that the foil is big enough to close easily around the apples or you’ll have an ooey gooey mess on your hands after it cooks). 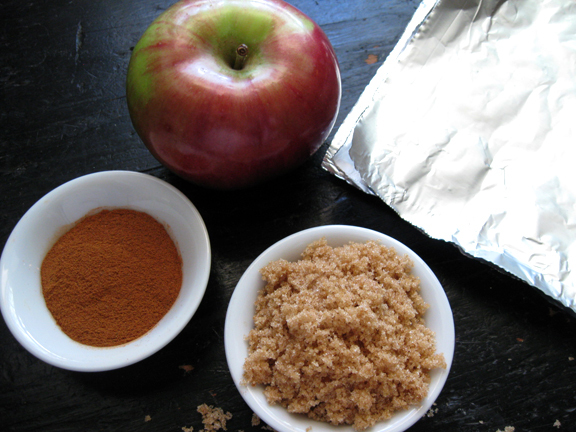 Sprinkle 1 teaspoon of cinnamon and 2 Tablespoons of brown sugar all over the apples. That’s it! Do you believe it? No butter, no anything else, the brown sugar and cinnamon combined with the juices of the apple make their very own magnificent sauce. Wow, why didn’t I think of this when I was a kid? I found that gathering each corner of the foil up and pinching it together kept all of the fabulous brown sugar & cinnamon sauce in the packet rather than all over the oven. Placing your packets on a baking sheet is a good idea as well. Bake in a 400º oven for 25 minutes. The result? Warm, succulent cinnamony (is that a word?) melt in your mouth baked apples. Make sure to pour all of the sauce all over the top, grab a fork and dig in! Maybe my mom was on to something. Now go have an apple! I’m convinced that we are all destined to become our parents some day. 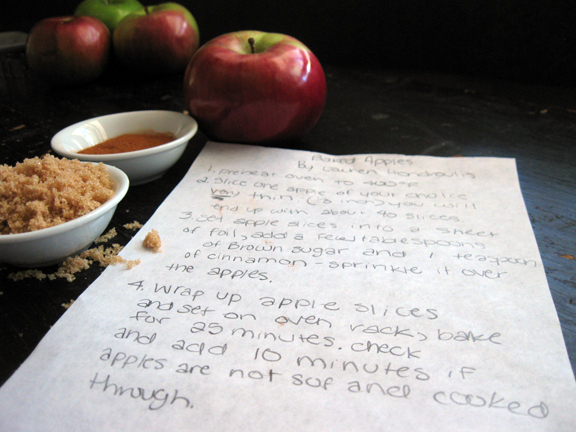 Love that your tween wrote up her recipe. And I’m with Amy, I could dive into some of this right now. Oh my goodness, looks fabulous!!! So easy too. I just brought home a big bag of Macouns from New York state – some of them will have to meet this fate. that is just screaming for vanilla ice cream! yummmmm. I recently read this in a magazine article on gauging your appetite: “If you’re not hungry enough to eat an apple, then you’re not hungry enough to eat.” That, of course, is complete nonsense because there are plenty of times when I’m not hungry enough for an apple but could easily put away a cd case-sized square of chocolate. But THIS? This would make me hungry for an apple. That looks delicious. My mouth is watering. I may have to go pick up some apples on the way home today. My daughter isn’t even born yet, and I am already turning into my mother. Lord help me. I am SO making this for dessert tonight. Or just a pre-dinner snack. This looks delicious, and I am going to be making these soon! I have to eat gluten free and this as a dessert makes me forget that!! It’s wonderful. Thank you so much for sharing! Thanks so much for this! I was making supper for mom (it’s always a disaster, but she pretends to love it) because she was working late again, and I realized almost too late that I forgot a dessert. She has quite a sweet-tooth, so supper would have turned out extra tragic if it wasn’t for this perfectly simple recipe. Thanks again! I am so happy to have found this recipe! I must’ve done something a bit off though, as the sauce portion didn’t really come together. Any suggestions for next time? I’m wondering if it might have something to do with the type of apple that you’re using? We use Gala a lot. 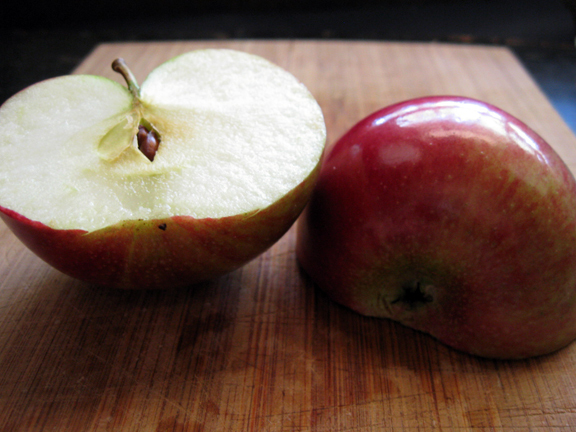 Perhaps the apple you’ve tried isn’t as juicy? 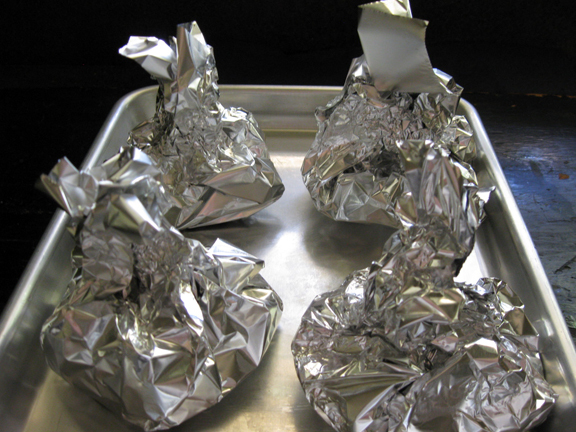 And make sure that the foil it tightly closed to keep all of the steam inside to help create the juices. Hope that helps! Thanks so much for stopping by!! I just made some baked apples and I didn’t cut them into slices, just core the apple, leave a bottom on the apple, put in the mix of cinnamon and brown sugar(more brown sugar than other ingredients) and nutmeg if you like, and add raisins if you like, all down in the core area. you can add a pat of butter on top. put in a baking dish that has a top. you can microwave for 3.5 to 4 minutes and it comes out delish! 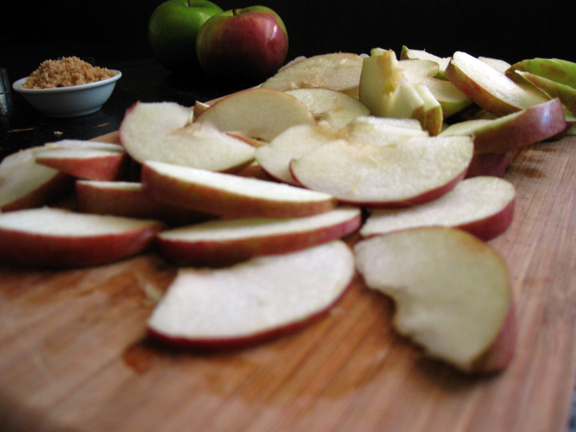 just spoon liquid back over the apple when done, The apple is soft and you can cut up and eat. I sometimes add caramel sauce and you can add granola, ice cream etc. so easy and tastes good whether microwaved or oven baked. In our oven now and we CANNOT wait to try them! We eat breakfast frequently at Cracker Barrel (so yummy) and they always give a little dish of apples. some, so thanks and now into the oven they go. Will make a batch of them, as my husband has to have his Blue Bell Homemade Vanilla Ice Cream and he will love this. What a surprise he will have. maaan! youve got me hooked! these apples are to die for! im making them from breakfast and putting them on some pancakes! thanks so much! your kids got some talent there mayum! I never comment on anything online but this simple recipe deserves it. Whipped these up in 30 minutes this morning to go with our oatmeal and my 2 year old DEVOURED these! My boyfriend and I loved it. I made this last night and was soooooooo yummy!!!!! Thanks for sharing. Only 2 points on WW too for me. I was looking for some ways to have kitchen creations for activities for senior adult it was wonderful,they were able to do it for them selfs it was a hit! Awwwwwwww! That is so so sweet! Melts my heart to hear that. Thank you so much for taking the time to share that with me! Great recipe for us poor college kids! It’s sweet, delicious, cheap, and a great natural source of fiber and energy! Love this! 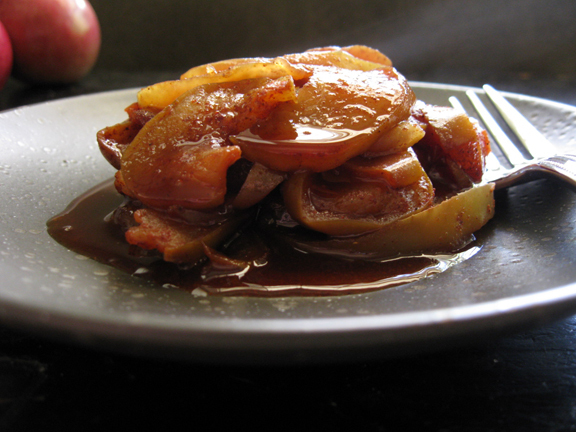 I was looking for a simple, baked apple recipe and this is easy and delicious. I added a bit of nutmeg and will be making these again for sure! I made this as a topping for some cinnamon oatmeal pancakes. It was delicious and low calorie! Thanks for sharing! P.s . I love your name!!!! I made this quick desert and it was awesome! !